Ilex is growing. Now in our seventh year of operations, we are expanding capabilities to support our clients in new ways. Over the last 12 months, we’ve broadened the services we deliver as well as the types of companies we serve. We have covered everything from rebranding established companies, launching start-ups and setting the agenda for customer events, to creating a thought leadership report for global management consultancy Accenture. We created sales presentations for Smart Cities initiatives in the Middle East and delivered PR campaigns across Africa. Online or offline, we are creating and delivering world-class content and communications that creates touchpoints for influencing our clients’ audiences. We also continued to add to our client portfolio with new additions including London Internet Exchange (LINX). At the same time, we’ve nurtured and grown together with long-time clients like Epsilon and Stage Intelligence. Just as our business has changed a lot over the last seven years, we’ve adapted and learned from these clients. Best of all, we’ve grown as partners and shared a lot of successes. Ilex is definitely not the same business we were seven years ago, and it shows in the diversity of clients we work for and the types of content and consultancy we deliver. We continued to develop our Channel Marketing offering with branded sales enablement content for our client’s partners, while there’s been increased demand for consultancy services. B2B technology and telecoms businesses want help in transforming their approach to marketing. We have proven case studies and we’re helping more companies go from focusing on product, to talking about the potential of their solutions to drive revenue and change the world. That’s what’s exciting. I’m extremely proud of how Ilex has expanded its global presence, with clients now spanning Singapore, Mumbai, Dubai, Turkey, France, UK, US, Canada and Brazil and beyond. From the Hawker Centre’s of Singapore to the Northshore mountains of Vancouver, Canada, we’re delivering local marketing across globally. From supporting the sales of enterprise IT solutions in the UAE to executing on a channel partner strategy in the UK, we don’t see any limits on our business and as we grow. We’re going to go deeper into new markets and enable our client’s success, strengthened by our proven track record and expanding portfolio. 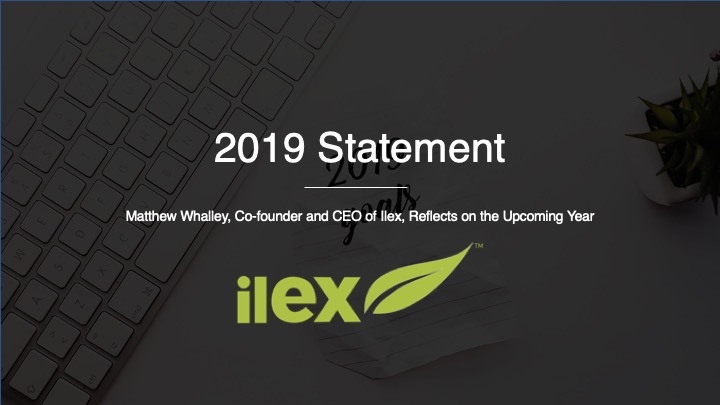 In 2019, Ilex will focus on expanding our scope to serve more of our clients’ needs and growing our business across new geographies and types of companies. We have had tremendous success as a creative engine for our clients, but we see a desire for more consultancy-based services, as well as tracking and managing content. B2B tech and telecoms businesses are increasingly asking us to help them transform their marketing departments, and tie content to leads and leads to conversions. So far, we have been doing the creative heavy lifting, but have a lot to offer through formalising our marketing transformation consultancy and adopting new tools for inbound marketing. Delivering More Consultancy – We know how to take legacy B2B marketing and transform it to lead an organisation and bring it up-to-date. That means helping clients to restructure how their marketing department functions to maximise efficiency, and optimise marketing with online and offline content. At the same time, we’re being asked to name products, companies and create start-up brands from the ground-up. We’ve been successful in taking start-up ideas and turning them into compelling brands, or taking legacy names and reinventing them. Consultancy leverages our creativity in new ways and creates new value for clients. Inbound Analytics and Tracking – After years of using Hubspot through clients, we will adopt and offer Hubspot to new clients. We have been great at populating Hubspot and giving clients all of the content they need to drive inbound leads, but now we will be able to offer a complete solution of compelling content and the functional tools for tracking leads and tying them to real revenue. That’s powerful for our business and will benefit clients tremendously. Scaling Up and Growing the Team – In 2019, we will add new team members to continue to expand and grow our business. This has been driven by new client wins as well as existing clients asking us to tackle more of their marketing needs. New staff means adding new personalities, skills and dimensions to our business. I’m extremely pleased with our recent hires because they bring new ideas to our business and offer clients new advice on things like Google Ad’s, Graphic Design, events management and a whole range of experience. Nurturing Our Core – We have a number of clients that have been with us for five or more years and we will work hard to adapt and grow together. We aren’t just “another agency”. We’ve learned about their business and many times shaped their messaging over years, so we offer them unique perspective on their businesses. It is important that we continue to evolve and take care of the clients that have been with us since the beginning. Expanding Our B2B Footprint – We have seen our business grow beyond the carrier industry where we started, and we want to continue to expand in new areas. We have worked with Cloud-based storage providers, Artificial Intelligence Platforms, Enterprise IT solutions providers, Broadcast solutions providers, Management Consultants, industry bodies- a whole range of organisations. As long as the company is focused on B2B, we want to serve their needs. Cloud-based channel-focused businesses and B2B AI platforms will be growth areas for us in 2019 in addition to our core telecoms and mobility clients. This time next year, we’ll be a bigger and more dynamic company. We will be managing more of our clients’ marketing mix and offering them more solutions. All of this will be underpinned by our core content offering and creative ideas. We will take our business to a new level and that will directly benefit both our new and existing clients.